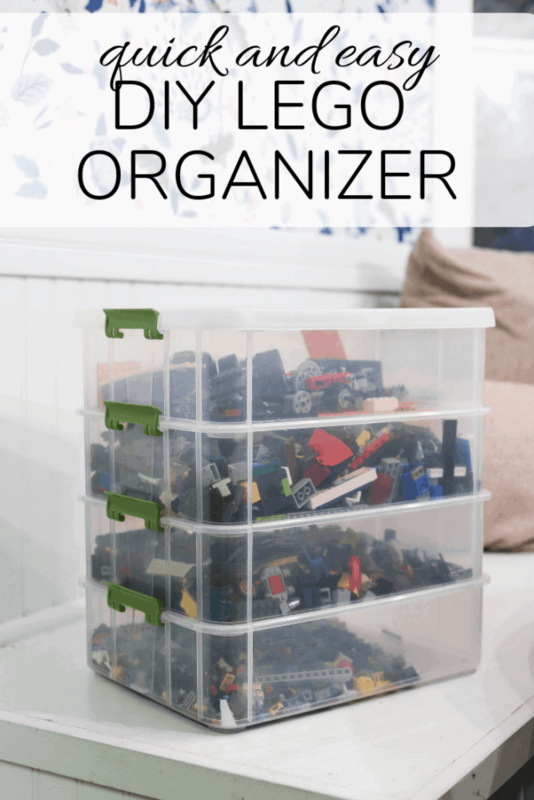 Today I’m sharing the easiest way to organize and sort LEGO bricks. 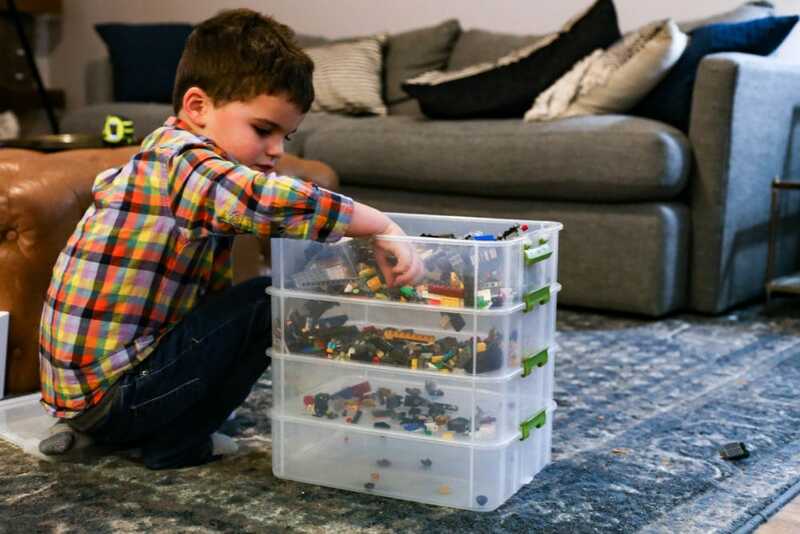 This super simple DIY LEGO organizer might just change your life! Recently, when we were cleaning out Jackson’s room (part of our Konmari challenge journey! ), I texted Corey at work and asked if I could just toss all of Jackson’s LEGO bricks so we could start fresh and actually keep them organized. I think he almost had a heart attack. Jackson is a huge fan of LEGO, but we’ve never done a good job of keeping them in any way organized. They were just tossed into a couple of plastic bins – which, honestly, meant that he didn’t play with them all that often because it was so hard to find anything! When I sent Corey that text, though, he knew I had had enough of the chaos, so he offered to come up with a solution. And, y’all, he delivered. 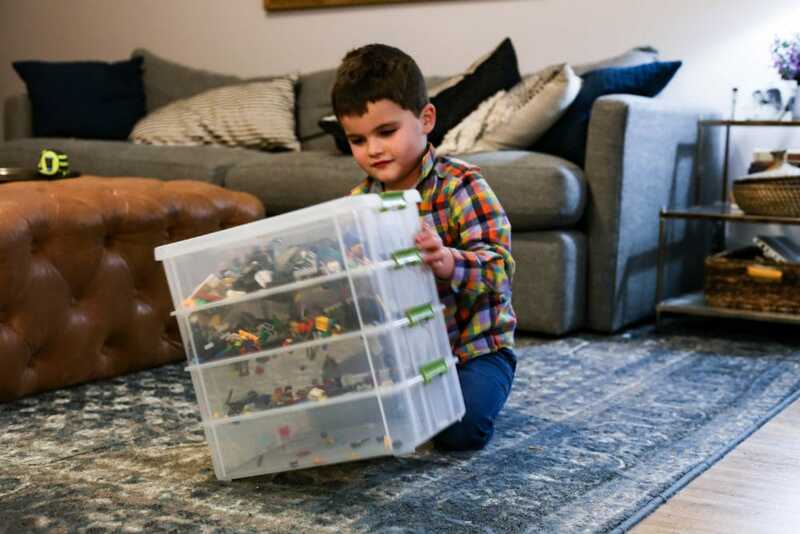 We got all of Jackson’s LEGOs organized and sorted last night and I had to come share this easy little DIY that will change the way you store your LEGO bricks forever. This might even be more life-changing than Marie Kondo. 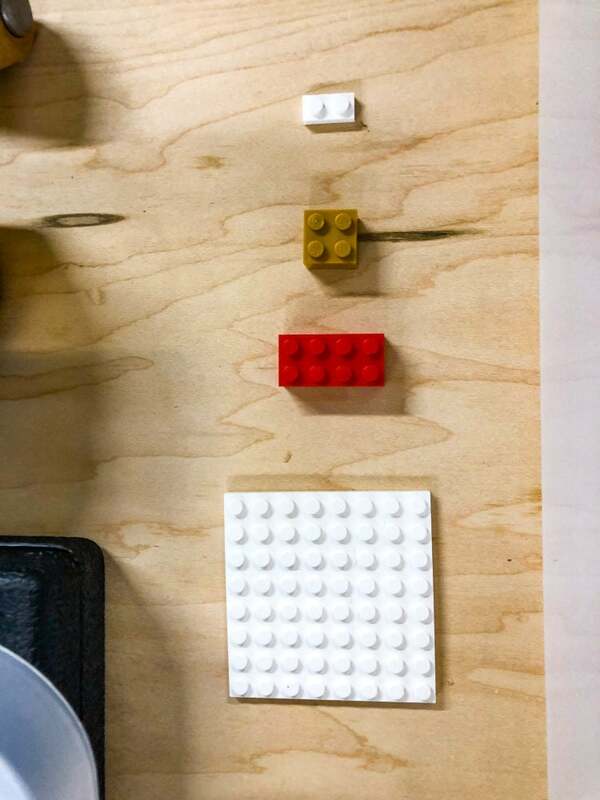 Start by determining the general size of LEGO brick you want in each box. The image above shows the bricks we used to determine sizing for our boxes. Grab your largest forstner bit and attach it to the drill, then grab the top plastic bin. Drill several holes in the bottom of the bin. Drill slowly! Then, grab a bit that’s sized lightly smaller than the next size of LEGO (meaning, you want that size to not fall through the hole). 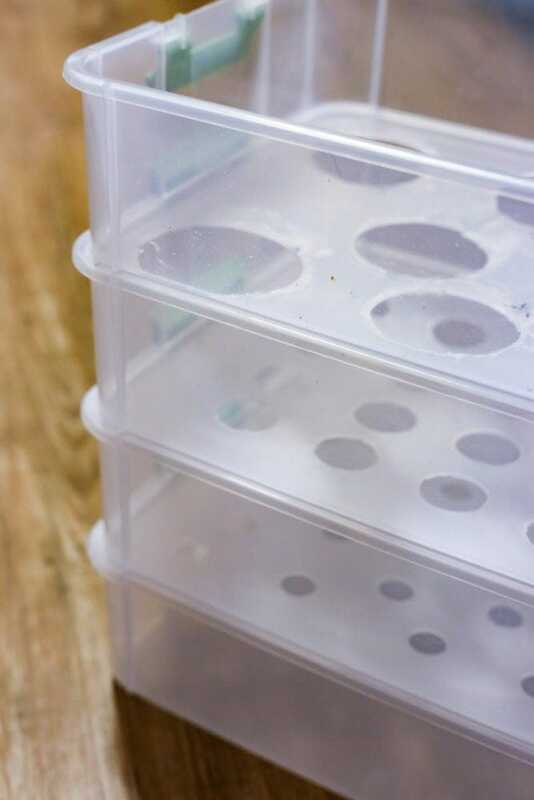 Repeat the process – for the smaller holes, you’ll probably drill more of them! Continue until you’ve drilled increasingly smaller holes in 3 of the 4 bins (obviously, the bottom bin will have no holes in it). Now comes the fun part. Stack all of the bins together and attach the handles, then grab your LEGO bricks and dump! The smaller LEGO bricks will automatically fall through the holes, and they’ll sort themselves. You may need to shake it up a bit (we also opened up each bin and manually moved the LEGO bricks around a little to help them fall through). Once you’ve shaken it up a little, you can open it and bask in the glory of LEGO bricks that are sorted (roughly) by size! 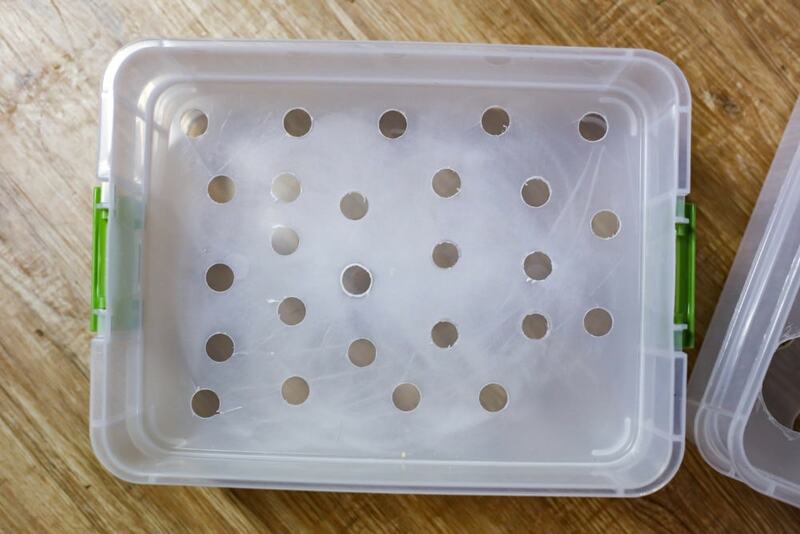 This was the simplest project ever (it took less than an hour!) but it was the perfect way to get the LEGO bricks organized. Jackson was so excited to see how much easier it will be to find what he’s looking for, and I have a feeling he’ll be playing with them a lot more often now. There’s also just something about knowing that the LEGO collection is nice and organized that makes me feel more on top of things. Like, my house is 5% cleaner just because of this project. 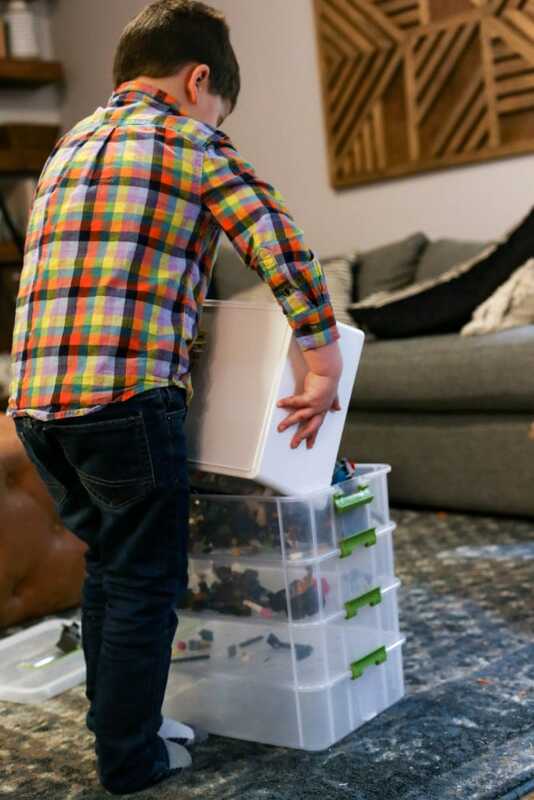 Do you have any other genius toy organization tricks? This is a great system to organize his current Lego collection! What I’m about to say will come as no surprise, but you’ll certainly need to evolve your storage system as his collection grows. I have four-Lego lovers, who have been collecting sets for a total of twenty years between them, and the number of Legos they have is staggering! When you get there, I’d suggest sorting by size as you’ve done, but also by type (vehicle parts, people paraphernalia, weird shapes versus basic bricks). Makes the hunt for that perfect piece a little easier! Good luck (and watch your step 😉)!